Museum Design: Where's Your Workshop? It used to be that every museum had an "exhibits workshop." An unsettling trend (to me at least) is the continuing wave of museums that have deliberately left exhibit workshops (staff access, not visitor access spaces) out of the mix. Can any museum that features interactive exhibits, or really any type of exhibits, ever become great (as opposed to just good) without some sort of workshop? Let me be clear, I don't think every museum needs a full cabinet-making workshop with full welding capabilities and paint booth. But if you don't have at least one place with a bench and basic tools to tinker, to prototype, or to just pull busted exhibits off the floor while you repair them, can your museum's exhibit program ever be living up to its full potential? Workshop spaces build and increase your museum's internal exhibit development capacity and create a tremendous staff feeling of "ownership." Especially as it relates to "we built that here" exhibits and the entire exhibit development process. I'm afraid that if you don't have a funky space to create, and explore exhibit ideas, your museum will inevitably cede some (or all!) of this important exhibit development process and skill-set to outsiders. And outsiders, including many architects with exhibit developer aspirations, are often the ones most responsible for eliminating workshop spaces from new building plans. If your designers and architects don't give you a workshop space with convenient loading/unloading access to the outdoors they are starting you and your museum off at a disadvantage. I'll never forget a visit a few years ago to a beautiful new children's museum. After walking around the space with the Director of Exhibits, I innocently asked to see the "exhibits workshop." He ushered me into a small rectangular office with a desk and chair wedged into the far end. One entire remaining length of wall was lined with deep shelves holding the cans for the 26(or more!) different colors of paint that the architect had used throughout the building. I was dumbfounded. I asked, "Where do you build new exhibits?" The answer: "We don't build new exhibits. We just hire other people to build them for us." Then I asked, "What happens if an exhibit breaks?" The answer: "Most of the time, we just put an "OUT OF ORDER" sign on the exhibit and call somebody to come and fix it." I worried then, and I worry now, about what the long-term effects of "workshopless" museums will be --- both for visitors and the museum field itself. How do you handle exhibit workshop space(s) in your museum or in museum projects you've helped create? 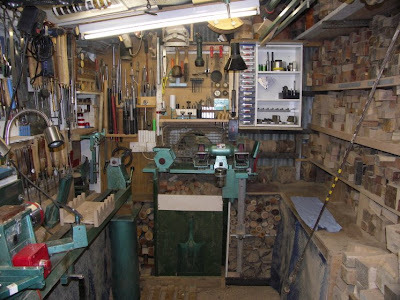 Are workshop spaces a neccessity, or am I just hopelessly "old school"? Let us know in the "Comments Section" below. This is a hot topic for me, the SOLE Exhibits staff person at The Discovery Center of Springfield Missouri. We do have a pseudo-workshop area, but it is pitifully under-equipped and neglected. Our collection of tools is 90% (accidental and intentional) leftovers from various constructions and installations over the years, combined with a few donations...things I found in the parking lot...stuff I’ve found inside exhibits (no kidding)…etc. Our "shop" consists of a workbench, a mixed batch of nuts, bolts, screws, etc., a toolbox full of misc. hand tools of mixed age and quality, and a few hand-held power tools (circular saw, drill, jigsaw, etc.). I certainly wish our workshop was more fully equipped...it really is barely adequate for me to do my job...but adding tools and equipment is slow, and usually happens on a project-by-project basis (i.e., I needed a multi-meter to fix the gyro-chair, so I have that now...I needed a table saw for another job, so we purchased the cheapest one on the market...etc.). For whatever it's worth...I surely don't think an emphasis on Workshop space is "hopelessly old school"...or perhaps I too am similarly hopeless...but I just couldn't do my job (which is keeping our interactive exhibits working, and on a rare occasion (due to lack of time AND adequate workshop) creating new items for our floor) without at least SOME sort of Workshop space. In the 2 years I've been at The Discovery Center, the Workshop has improved, but it remains my hope and goal to continue to develop, improve and expand the shop as I continue to develop, improve and expand my own skills! At the Oregon Museum of Science and Industry (OMSI), we have a 25,000 square foot building immediately adjacent to our main museum building that we use for Exhibit Production. We also have two smaller shops, 500 and 1000 square feet in our main building. Our exhibit shop has a dedicated cabinet shop, office space, paint booth, metal and welding shops, some storage areas and space to stage new exhibits in process. We currently have 22 full time production staff. I'm surely a bit biased, but in general, I've observed a correlation between a museum's ability to build it's own exhibits and the quality of it's exhibits. Those museums that had no or limited capacity to build exhibits, often had a higher percentage of broken exhibits. Where as those museums that have some sort of shop, tended to have better maintained exhibits. The most important element of a shop is the people that make things happen. However, without some space to do their work, they can be of little value. Keep up the good fight! I really believe that a better workshop DOES make a better museum. OMSI certainly must be toward the far end of the spectrum, workshop-wise! Probably OMSI, The Ontario Science Centre, and The Exploratorium have the biggest exhibit shops and staff. That's a very interesting comment about how well-maintained exhibits and exhibit floors are being correlated with exhibit shops and staff. I wonder if there is any hard data to back that up. Does anyone know of any such reports or data like that? I've experienced different points on the spectrum. When I was at the London Science Museum we had both a huge (10,000sq ft) workshop for maintenance, object conservation and carpentry plus a more commercially-focussed interactive exhibit workshop (which has now closed). The problem there was that exhibition projects were generally huge, so the exhibit workshop couldn't meet demand on its own, but between projects could stand idle (hence the move to commercial work). We sustained this for a few years but eventually found our costs were too high to compete commercially. Interestingly, because the museum always had to commission at least some of it's exhibits, it became quite an informed (and demanding) client. I'm now at the Centre for Life in Newcastle, one of the UK's millennium projects. I have replaced 2/3 of the original exhibitions since 2004 and have my eye on the rest! We have a tiny maintenance workshop (>500sq ft) and a VERY good maintenance team (but they're not designer/fabricators). Until I arrived there was no exhibition development expertise remaining on the staff, so I recruited a project team. For me, the key to external commissioning is to be very clear about what you want and how you want it to perform BUT that has to be combined with a real understanding of what is possible (which means understanding how things are made!). Contractually that means allowing time and money to prototype things, and building a collaborative relationship with your contractors. Too many museums start with an adversarial mindset, which is never going to lead to good results. I'm lucky that I know a lot of the UK contractors pretty well (so that I can tap into relevant expertise) and now I think I would much rather target money towards them than try to maintain a permanent exhibit workshop here. I recognise that I come from a "projects" background where that is more appropriate, but I don't think we're big enough to always have a build project on the go. I don't know if that helps or not, but it is possible to produce good results without your own workshop if you can commission carefully! At our children's museum, we do have a small workshop that has all the necessary equipment but a serious lack of space. Most of our large-scale work must be done in a warehouse area next door (a space often used for programming or events - so you can imagine the arguments over scheduling!). However, we are in the process of our expansion project and as we are planning our new building, we have doubled the workshop space, including more open space for large pieces, and added a painting room, which will allow us to paint without being concerned with wood shavings, dirt, etc. As a small museum that relies heavily on in-house fabrication, I believe strongly that serious consideration must be given to the needs of fabricators in terms of a workshop. I agree that there's a correlation to satisfaction with the space and quality of the exhibitions, but I also think that you can make amazing exhibitions with the space given, even if inadequate.